Origin and Habitat: Arthrocereus rondonianus is common in the Brazilian State of Minas Gerais ( in the Serro do Cobral and the west side of the Serra de Espinhaco and Serra de Minas, in the region of Diamantina) and in southem Bahia. Altitude:About 900-1100 metres above sea level. 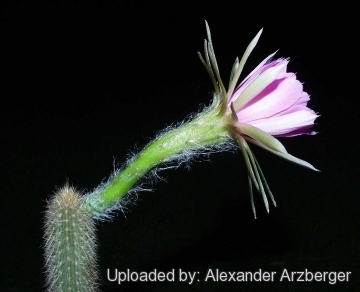 Habitat: It makes groups of stems in rocky places, sometimes under trees, often growing with large plants of Discocactus placentiformis. In some population it crawls across the soil like snakes, often beneath accumulations of dry litter. It is threatened by habitat loss. 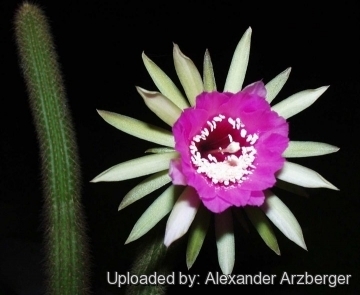 Description: Arthrocereus rondonianus is a small cereoid cactus with colourful, scented, nocturnal flowers. 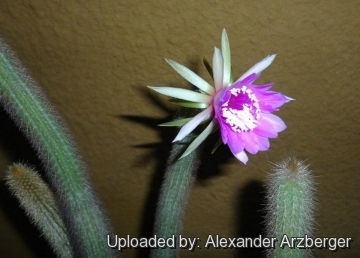 It is unusual among night-bloomers cacti for its pink flowers. Habit: Plants somewhat erect, half erect or prostrate with slender stems branching from the bottom. Stems: Cylindrical, bright green, about 2,5 cm in diameter, 25-70 cm long. Ribs: 14-18 low and rounded. Radial spines: 40-50 fine, acicular, bristle-like, densely clustered, greenish yellow, golden yellow or reddish-brown, up to 5 mm long with a few to 2 cm long. 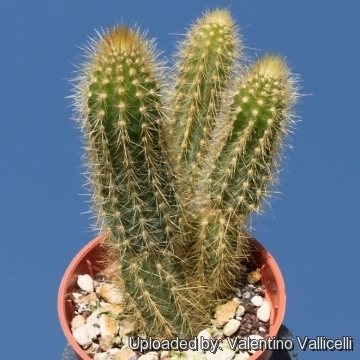 Central spines: 1-2 up to 7,5 cm long, but usually shorter protruding sparsely through the numerous thin short radial spines. Flowers: Large, mostly near the tips on the sides of the terminal joints, purplish-pink, up to 8 cm long and pleasantly scented, a character associated with moth-pollination. Tubes long, thin, with fuzzy wool and hair-like spines. Fruits: Green, scaly and round. 6) Urs Eggli, Leonard E. Newton “Etymological Dictionary of Succulent Plant Names” Birkhäuser 2004. 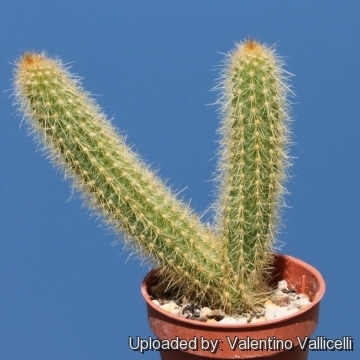 Cultivation and Propagation: Arthrocereus rondonianus is not the easiest plant to keep happy, grows best grafted but cuttings of stems can easily be rooted. Under glass, it isn't difficult, but appreciates milder winter temperatures and more generous summer watering than most of the other genera of cacti. 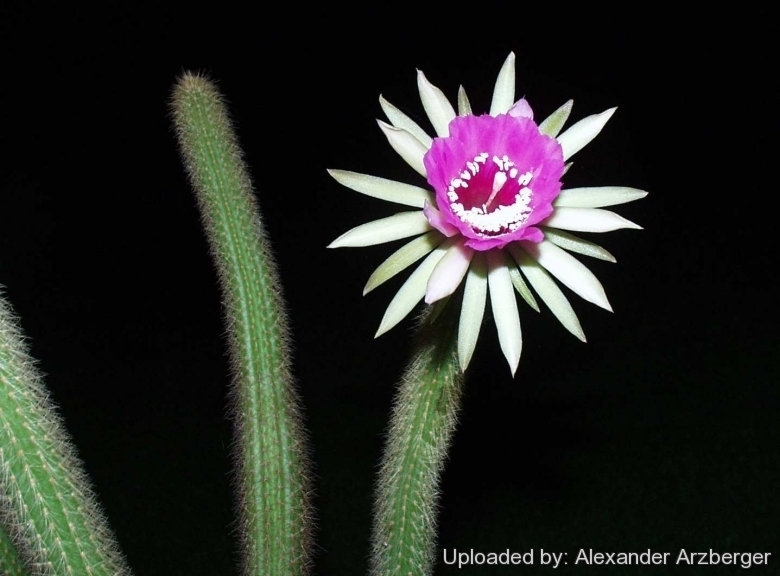 It grows fast, and produces impressive flowers with an exotic look shared by no other cacti, and it generally attract a lot of attention.. Even so, it is fairly uncommon in collections. 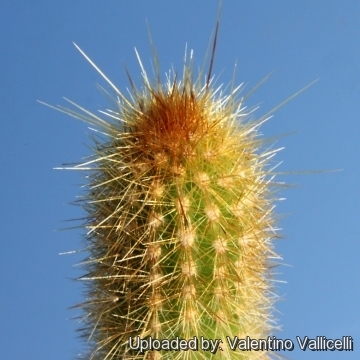 Soil: It likes very porous standard cactus mix soil. Prefer a low pH compost, avoid substrata rich in limestone; otherwise growth will stop altogether. 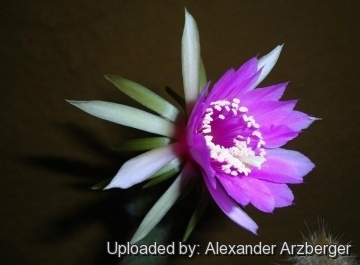 Exposition: The plant tolerates bright situations but enjoys filtered sunlight or afternoon shade, inside it needs bright light, and some direct sun. Tends to bronze in strong light, which encourages flowering and heavy spine production. **Waterings: Arthrocereus rondonianus is rot prone when kept on its own roots and though it can’t endure long stretches of total dryness, too much water with cool will rot it, as its weak root systems tend to be inefficient at sucking up water from wet soil. Hardiness: It is rather difficult to grow and frost tender, it can’t stand cold, or even fairly cool temperatures and should be kept at above 10° C if grown on its own roots (5°C if grafted). 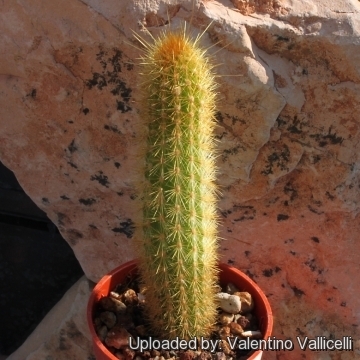 Uses: It is an excellent plant for container growing. The neat pink flowers are really beautiful and it is certainly worth visiting the glasshose at night to see them. Its golden spines makes it an attractive plant, even when out of flower. Propagation:*** Seeds, cuttings or grafting. Seeds germinate in 7-14 days at 21-27° C in spring, remove gradually the glass cover as soon the plants will be well rooted (ca 1-2 weeks) and keep ventilated, no full sun for young plants! .Young seedlings are often grafted on a low stock to keep the plant in a good shape. To make a cutting twist off a branch and permit it to dry out a couple of weeks, lay it on the soil and insert the stem end partially into the soil. Try to keep the cutting somewhat upright so that the roots are able to grow downward.